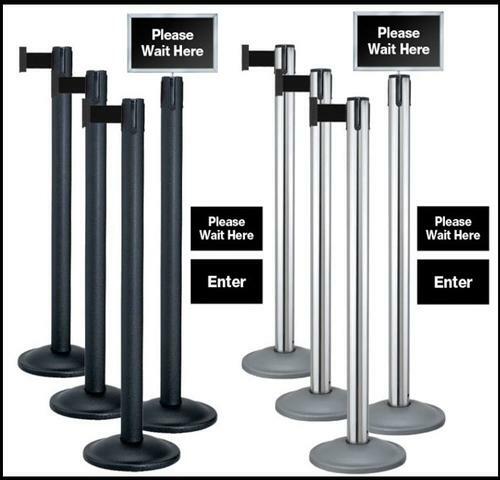 Our 4 Post Economy Queueing system with Signs, Includes 4 retractable-belt posts, one post-top sign frame with bracket, and 2 sign graphics. An incredible deal at a budget-friendly price. Posts are shipped flat to keep shipping costs low. Easily assembled with a simple twist of a key (included). Once assembled, posts become permanently affixed to bases. Post finishes availalbe in wrinkle black post and base; chrome post and wrinkle charcoal base. Choices of 10 belt colors to complement any décor. The built-in 4-way Connection allows attachment of belts from any direction, including most other manufacturer’s posts. Universal Belt End works with almost every post on the market. Easy-to-replace belt mechanism makes it simple to change belt colors or add a custom-imprinted belt right in the field, without having to replace the entire post, extending the life and look of your queue. Slow-retract belt keeps customers safe by retracting slowly and safely every time, thanks to our unique centrifugal belt-braking system. Slotted Rubberized base provides maximum protection against floor scuffing, yet unlike other posts, provides needed airflow to expedite floor drying. Heavy-gauge steel post resists dents and scratches. Cast-iron, powder-coated base provides exceptional stability.5-year Manufacturers Warranty on post and 2-year warranty on belt mechanism – the best in the industry! 7” x 11” Sign Frame instantly adds important in-line messaging. 2 In-line Sign Graphics help to efficiently guide customers. Specifications: Post Height 38-½”; Post Weight 30 lbs. ; Post Diameter 2-¼”; Base Diameter 12-½”: Belt Length 7’; Sign Frame Chrome Fixed mount, slotted Sign Graphics (2) 7” x 11” single-sided card stock. 4 Post Economy Queueing System with signs. Heavy-gauged steel retractable 7'-belt posts, post-top sign frame, and 2 sign graphics. Easily assembled with key twist.